We're addicted to DDB, Stockholm's work for McDonald's. (See "WAKE UP!" and other randomness.) There's a strange and wonderful pixie magic about it that McD's lacks Stateside. Check out the spots for "No Big Deal," a campaign brought to our attention by Ads of the World. Finding a geriatric under your hood, a knight at your doorstep, an artist who paints with his toes, or a troll playing games with your kid, doesn't even register on the radar against McDonald's humblest meals. If those unnatural-looking meat patties tasted anything like how these ads look, we would eat them every day. Well, probably not. But we'd maybe have chicken nuggets once in awhile. 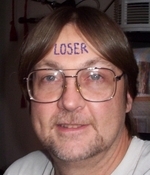 - Score about $10,000 to get a logo tattooed across your forehead. Add another $2000/year to keep it there. Got anything better to do? - BlackBerry is profiling executive-level users on its website and in print ads. See the interview for Jason Pomeranc who seems kind of like a ... never mind. - The Wall Street Journal killed Chuck Schwab. Well no, not really, but this WSJ parody site did point out his untimely passing. If Chuck is dead, we don't want to talk to anybody ever again. - More behind-the-scenes Foam City stuff for Sony. Will you just SHOW US THE AD already?! - Orgasmify my world? Hell yes! Oh, you meant "organify." Um, awesome. - The TreeHugger guy said we'd "get a kick/sigh" out of this. We're really just perplexed. Early today Advertising Age ripped into Starbucks for its Pike Place coupons and throwback cups (in stores for six weeks, a barista told us). All part of an ongoing attempt to rekindle stale sparks with a costly ($100 million) promotional campaign, which is looking more Grocery Chain -- and less Indie Cafe -- by the minute. Once upon a time, I loved Starbucks more than my hypothetical Firstborn-to-Be. It'll take a lot more than a buttery homebrew and gaudy vouchers to rein in the trouble of a brand that's just become too commercial. While the IS F tears up the open road, the young lovers are on a path to tear their relationship apart. In the chapters that follow, eight additional authors have their way with Terence and Julia. This is the kick-off for "In the Belly of the Beast," a collaborative story for Lexus Magazine (with logistical help from Story Worldwide). Participating authors include Jane Smiley, Pam Houston, Brian Antony and other scrivs unduly flattered by the Lexus pressie, titled "FORGET KEROUAC -- GO ON THE ROAD WITH LEXUS ORIGINAL FICTION." The IS F: a great shag, and literary too? Mercy, I feel a Lifetime tie-in. See last year's effort, "Black Sapphire Pearl." If Laughter is a Symphony ... Why Do I Have Chills? This website, where you can make a symphony out of other people's laughter, is disturbing. I swept my mouse over a few faces by chance and am suffering from serious eek!-factor, probably because The Exorcist has warped my perspective of all things sweet and cuddly. If you can get past the whole symphony-of-mirth thing, check out the cookbook for recipes like the Laughing Turkey Wrap. It might come in useful if you ever want to spark an intervention. Created by Lowe Roche, Toronto for Laughing Cow, the site generates traffic from a print campaign with peel-away messages trussed up like pieces of cheese. See how pretty, even beside a pee stick? Ford Cars Used To Be Bad But Are Now Worth Buying. Honest. [Ed. We commented on Ford's new Drive One tagline earlier in March. Now Advertising Age comments. Now, we comment again.] Just when you think that re-designed cars that actually look good and drive well - step forward Ford Focus and Chevy Malibu - might position the American carmakers to start winning back the market share and brand battle that they have been so abjectly losing to their Japanese rivals, AdAge reports on Ford's new campaign, called "Drive One". Have you driven a Ford lately, anyone? Is It Wrong to Want to Live in a World Manufactured by Sony? Having teased us for weeks with videos and imagery, Sony has finally launched "Foam City," a spot for a line of camcorders and cameras, not the Bravia TVs like we originally thought. Beautiful work. The music gives it a dreamlike quality, and people are depicted playing in the white menagerie while immortalizing the occasion with cameras. To promote afternoon Happy Hour, Hapa Sushi Grill & Sake Bar coupled public utility images (like the "Slippery when Wet" symbol or the crosswalk man) with the legal language of liquor advertising ("Drink responsibly"). The result is a set of prints that merit a double-take and a smile. 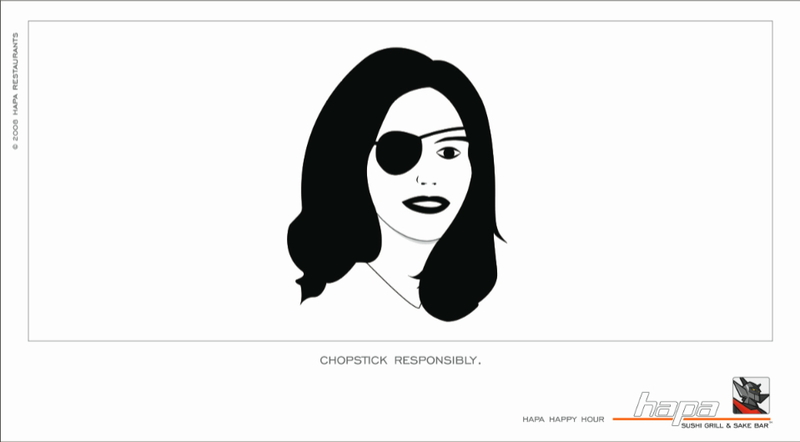 At left is "Chopstick responsibly." Also see "Flirt responsibly" and "Dance responsibility" (wardrobe malfunction!). Agency: TDA ADVERTISING & DESIGN, Boulder. vitro robertson recently launched this bus shelter campaign for Newcastle. In each poster, a glass of Newcastle beer is set alongside something prickly, like a blowfish or a cactus. The part nearest to the beer is jarringly barb-free. 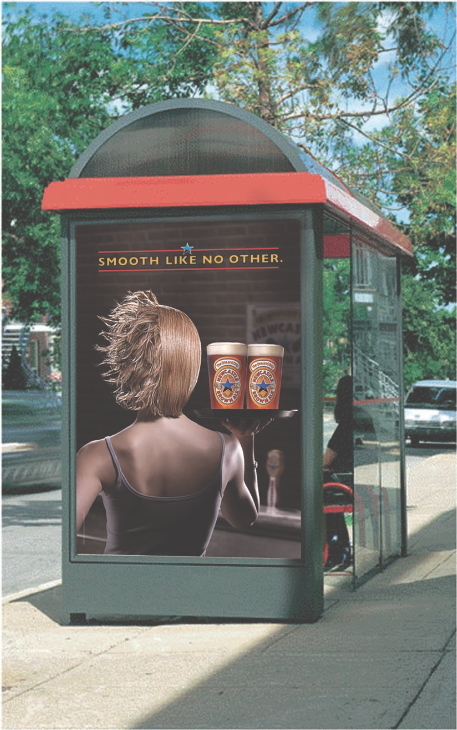 "Smooth like no other," the ads read. Weird. But you know what would be neat? If the ads were tactile, maybe in a magazine or something. They could be like scratch-and-sniffs, except for your fingers. - Here's a trailer for The Big Bang Theory, a comedy of geek/glam stereotypes that will probably last all of two seasons. And the saddest part is, I'll probably watch it at some point. It returns April 14 on CBS. - This stunt by agency New Message for The Phone, a Dutch show where a randomly-placed phone surprises whomever picks it up with a chance to win 25,000 Euros, was called "HILARISCH!" by one a YouTube fan. I didn't find it that funny, but I like that there are people somewhere in the world shouting "HILARISCH! ", possibly even as I write this out.